When one mentions the phrase “Ancient Greek art” one would have imagined mostly statues, paintings, pottery and architecture. They also imagine realistic depiction of humans and rightly so. It is after all the Greeks who were the first the ideal look of the human body. You definitely won’t find fat men in Greek art because they’re ugly. It is this pursuit of perfection that would dominate western notion of what is considered as art for many ages. Indeed, even today war is being waged against modern artists because their works seems to lack any sense of artistic standards, drawing only inspiration from emotions and comes up with nothing but ugly and bland art that doesn’t really connect or appeal to the audience. Greeks started chasing the ideal way back since 700 BC, at the beginning of what’s to be known as the Archaic Greek age. It was during this Archaic age (700 – 480 BC) that the Greeks learned to portray realistic humans in their art. The sculptures at that time were divided into two: The Kouroi for male depictions and Korai for female. Then came the Classical Age of Greek art. After learning how to sculpt humans, Greek artists started depicting them in a more human way. They would depict them being relaxed, showing emotion or doing something. It gave Greek art a more naturalistic style. When one views them its kind of like playing a game of charades. You can tell what they’re what they’re doing, what they’re thinking. This gave Greek art the ability to make a connection with their audience, telling stories through the art. This is the beginning of the Hellenistic style, which is characterized by a connection with the artist’s emotions, but still upholding the same realistic perfection their predecessors has pursued. This Greek spirit of art, that which seeks to express the artists’ emotions through a realistic and ideal style became a defining rule in art, especially to those who came after the Greeks. Before the Renaissance, more than 1000 years after the end of the Hellenistic age of Greek art, they still uphold the same sense of standard their predecessors had, though not as strong as before. When the Renaissance finally happened and Europe rediscovered Greek philosophy, it ushered in a renewal of that commitment to the realistic and ideal aesthetics in art. It became the birthplace of masters that would bridge the modern with the ancient. It is where the greatest pieces of art the world will ever know were created. In sculpture it gave birth to works like Donatello’s David and Madonna of the Clouds, Michaelangelo’s David and Risen Christ, the Pieta, the Deposition and many more. The world of paintings isn’t lacking as well. The Mona Lisa, famous all over the world for her knowing smile, was created during the last 200 years of the period. 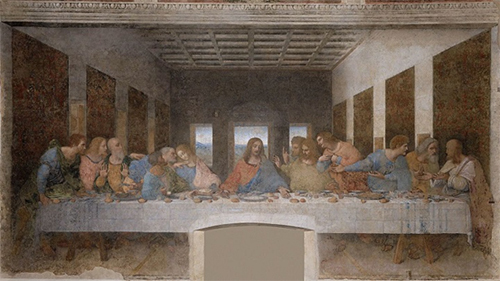 Other known works are Titian’s “Sacred and Profane Love”, Michaelangelo’s The Creation of Adam, and Leonardo da Vinci’s The Last Supper. If modern artist would hear one criticizing modern art as bad while Renaissance ones are masterpieces they would accuse him of gatekeeping art. They believe art is art and that’s actually true. However there is nothing bad about gatekeeping art. While we should accept that all art is art, and that all art shouldn’t be censored or prohibited, we should also uphold that sense of perfection that the past artists has perfected. Approve what we know is good while disapprove those that is bad. This is the Greek’s lasting legacy to art and we should honor this legacy by keeping this rule.